Divorce has a way of showing you who your true friends are. From the buddy who stayed up with you the night before you finally filed the divorce docs, to the cousin who was willing to watch the kids at a moment's notice when you sorely needed a break, you never forget the friends and family who help you get through divorce. 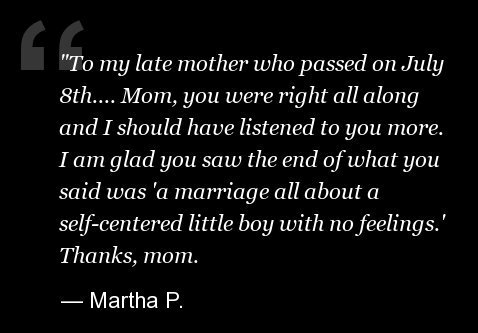 On Tuesday, HuffPost Divorce readers told us about the people who helped them recover during and after their splits. Click through the slides below to see our readers' thank you notes, then head to the comments and tell us about the person you depended on most during your split.